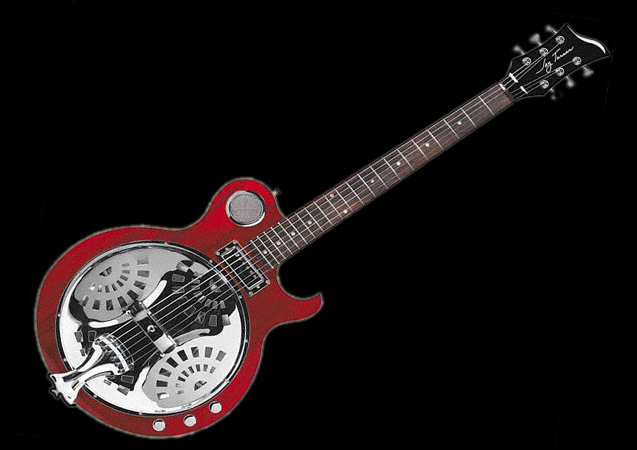 Electric solid-body resonator guitars, though not impossible to find, are fairly uncommon. Among industry models, for the last two decades National Reso-Phonic’s Resoelectric has been the unconfirmed leader of the pack in this particular category. But many players don’t have the cash to purchase an authentic National, new or used. Does that mean creativity should be stifled? The only answer is, of course not. Then why not take a look at the Jay Turser® JT – RES guitar, which offers an inspiring resonator sound for considerably less than the cost of a National Resoelectric. What’s So Special About an Electric Solid-Body Resonator Design? When playing slide guitar on an electric solid body, most players simply adapt the action on a conventional axe. But for those electric pickers who have a yearning for tonal qualities which are slightly more complex, a resonator could be the way to go. The additional sound characteristics provided by the resonator cone offer pumped up volume and a rounder string character. The JT-RES, by Jay Turser®, also has a ported sound hole in its upper bout, further liberating trapped timbre. 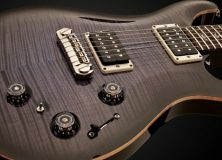 Jay Turser® Guitars is owned by U.S. Music Corp., of Buffalo Grove, Illinois, a division of Canadian based JAM Industries. 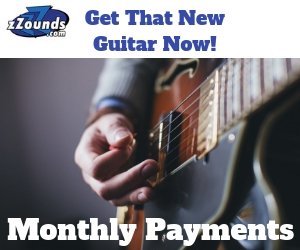 The U.S. Music Corp. also distributes Washburn, Randall, Parker, Hagstrom and Framus instruments, among others. Jay Turser® guitars are manufactured outside of North America. How Does the JT-RES Stack Up? National Resoelectric is the benchmark most other six-string solid-body electric resonators try to emulate. It’s equipped with both a piezo and a humbucker. So is the JT-RES. The National can blend pick-up combinations. The JT-RES can do the same. 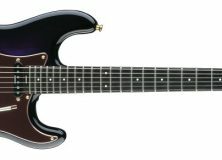 The Resoelectric has a deeply cut lower shoulder, maple neck, spider bridge and chrome cover plate; likewise, the Jay Turser® model. The JT-RES sports a solid poplar body, rosewood fingerboard, dot inlay fret markers, medium jumbo frets, an adjustable truss rod and chrome die cast tuners. It’s available in gloss finishes, either See Through Red or Antique Sunburst. As for electronics, at the neck is a mini-humbucker and at the bridge, a piezo pick-up. Controls consist of three knobs — volume, tone and blend. What Sets This Guitar Apart? It’s not often that you see an electric resonator with such a deep swooping cut away, allowing full access to the upper register, but it’s true with the JT-RES. While the Turser® box maintains a vintage look largely due to the traditional resonator cone cover plate pattern, it’s beautifully shaped headstock, screened sound hole and slightly offset positioned controls, give off a unique vibe. If you can’t afford a National Reso-Phonic Resoelectric, the Jay Turser® JT-RES retails for around $350. Don’t let your creativity suffer. As a vintage and contemporary music enthusiast, guitars dominate Paul’s life. He plays slide in open tunings on a National Steel Tricone resonator and electric blues, in standard tuning, on an assortment of other instruments including his white Fender Stratocaster. This guitar DOES NOT have a ‘ported sound hole”. The round grille in the upper bout is purely cosmetic and no “trapped timbre is further liberated”! The piezo bridge pickup is unbuffered and therefore produces a very bright, bass free, tone.